Today is the last day of September. I am in shock that the year is going by so quickly. Tomorrow would be my parents anniversary. I believe it would have been their 73rd. Not a day goes by that I don't miss them both. 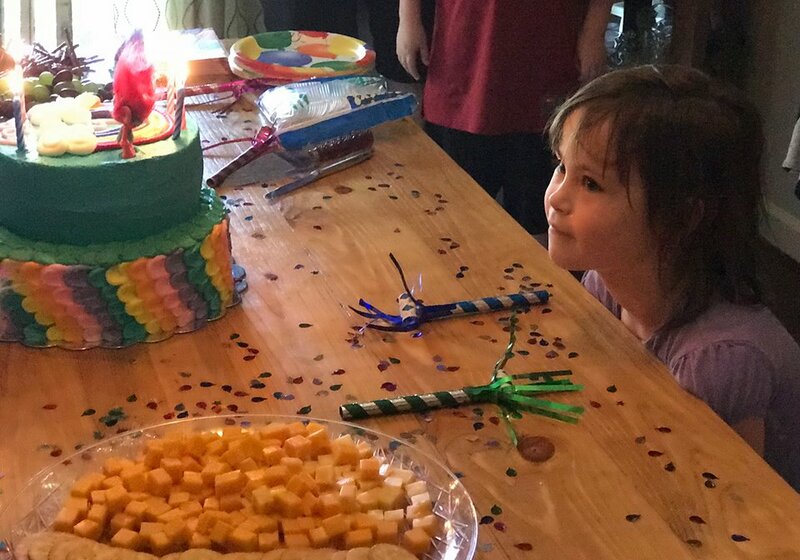 Our great niece Joy celebrated her sixth birthday today. We try to celebrate as many of our nieces and nephews birthdays as we can while they are young. We found out quickly as they age, aunts and uncles are no longer cool. It has been a busy day, full of chores, it seems we are always playing catch-up. Jordan's doc is sending him to an allergy doctor. I think there is probably some asthma lurking in his lungs and gunk in his sinus cavities. Rick took the picture of Joy. I thought it was such a sweet picture. She had a very happy day. Wishing everyone a Sunday of peace. May we all know love and kindness. Jordan is still under the weather. He is going back to the doc tomorrow. The doc keeps saying allergies, but his cough is not any better. Asthma and lung issues are rampant in our family, I hope that gene has not been passed to him. Rick and I got Jordan to read to us today, from one of our books, The Rural Life by Verlyn Klinkenborg. Jordan is nine years old, as he read to us I sat there amazed that he was reading a book that some adults would have a hard time reading. And then he told us what he had read. I know that today's kids are so much smarter than I was. It has been a nice normal Friday. You know you need those normal days. Days when the routine runs like clockwork and life is calm. This was the day I needed today. My hot tea awaits. I wish you all a good night. May life treat you kind tomorrow. Each time I walk the dogs, I see something new. Maybe it's just that I have trained myself to look, but I am never disappointed. 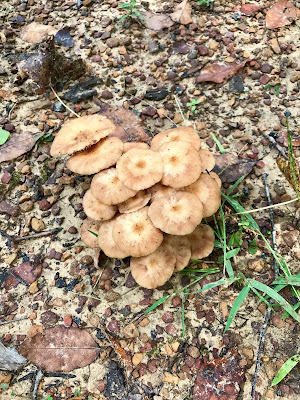 We always have some sort of mushroom fungal stuff cropping up, but these little ones fascinate me. 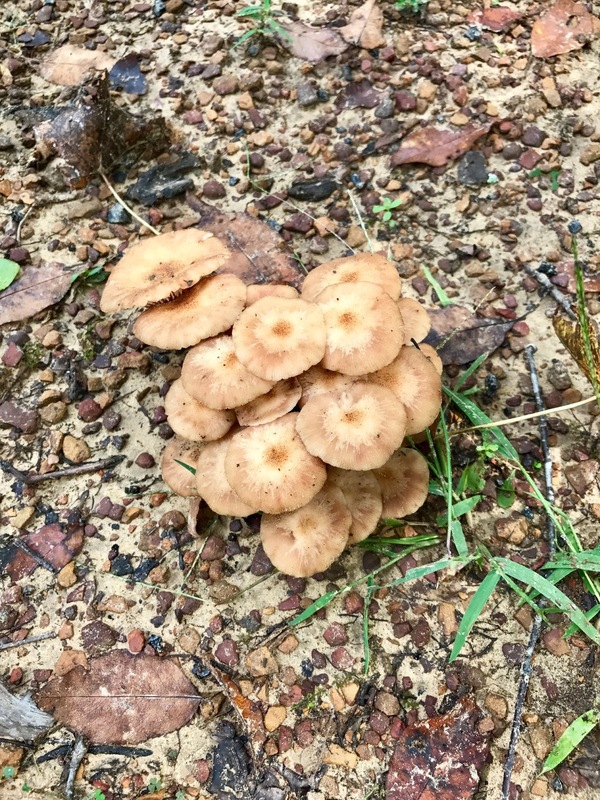 At first they looked like buttons, then they looked like tiny parasols. I love their color and the way they crop up in a tiny community. Does anyone know what they are? Early morning class, I love my staff students! When your fellow employees come to your class, it makes your day. Rick and I took most of the day off to spend some time with my sister. Don't you love road trips, driving the back roads, seeing everyday beauty. We visited a town south of Birmingham called Wetumpka, amazing old bridge, beautiful little town. Sometimes just getting in the car and driving some place different for few hours gives the soul a good break. Rick and I had both worked very hard the past few weeks. We could have stayed home and worked around the farm, but we have done a great deal of that lately as well. We needed different. Some time to take a fresh look, to laugh, and not think about work for a few hours. I highly recommend taking a drive when you feel the brain fog closing in. Leaving your surroundings for just a little while helps, it changes your perspective. My tea awaits. Jordan will stay with me until I go to work tomorrow. Allergies are really getting him down. We need rain and cooler temps, but nothing in sight. I did the final nurse's seminar today. The director of nursing gave me a glowing review. She said the nurses had loved my class and that it was one of their favorite parts of the all day seminar. I admit I was nervous. It is always tough to teach your peers, you want them to understand what you do and appreciate it. I am drained tonight. Early class tomorrow. As I looked out this evening I saw the new moon shinning so bright in the dusky sky. Our days have been so beautiful, just wishing the heat would subside and the temps would be more seasonal. It was so hot when I walked the dogs today they wanted back in the house after ten minutes. I was ready to go back myself. We finished up the chakra classes this afternoon. We will spend Thursday's classes on breath work and then start the yamas and niyamas next week. Today's class was about communication, wisdom and spirituality. I know it seems as if I teach so much about yoga, but honestly what I teach in a 12 week period is a drop in the bucket. My hot tea is waiting. Early morning class tomorrow, my bed is waiting. Make Wednesday your day to be extra kind. Getting ready to walk the dogs this morning this beautiful piece of work met me at the gate. I am creeped out by the surprise of a spider web in my face or hair when I am walking, but I love seeing them first and admiring their handiwork. The heat goes on. I know that many of you are experiencing un-fall like temperatures. I think our bodies are so confused. The days are getting shorter, our bodies expect the temps to fall and they are struggling with the mixed message that mother nature is sending. We are going into one of driest (October) periods of the year, so we have the heat, ragweed and dust to deal with. Not the best of times to be here in Alabama. The weird thing, I am craving fall foods. I cooked sweet potatoes, beets and Brussels sprouts today and an apple tart. Go figure. Not exactly 90 degree weather food. This will be a busy week again. I teach another nurse's seminar on Tuesday. We are rehearsing daily getting ready for the Fayette Frog Level Festival in October. It's our first time playing we want to be good. This is the last week in September. Continue to spread kindness and joy. It is important that we as humans reach out to each other. Whether we think we need each other or not, we do. Our connection is vital for the human race to survive. This is the last week of September. This year is moving so fast it makes my head spin. This morning as we drank our coffee on the screen porch I experienced some moments of melancholy. Not that I am ungrateful, because I have so much to be grateful but scared that life is moving so fast I won't accomplish some of my dreams. I work very hard at keeping some sort of balance in my life. Music gives to me. Sharing our music gives me incredible joy and personal satisfaction. It just gets harder and harder and to find places where we can play. I am not sure if our imagine is right, if our songs are not good, if our voices are weak. I am at a place where I find myself questioning. The zen teacher in me tells me that all things come in due time. The human part of me knows how fast time is zooming by. I know this too shall pass, but it is making for some difficult days. Aging brings good things like more wisdom, deeper love and peace but it also stirs up the ashes of regret on some levels. Sorry, I think the loss of two good friends this summer and family members has made me a bit sad. It has been a beautiful day. But it is hot. Like mid-July hot with high humidity. But I hear rumors of the jet stream changing by October 1 and more fall like temps arriving. We already have more fall color than we did all last fall. Last year's heat and drought left us with nothing but brown dried leaves dropping from the trees. We do have hard woods here so our late fall can be very pretty. My favorite Britt shows come on Public TV tonight, so excited. We do have a festival to play the first Friday in October so we are about to practice. Give someone a hug tomorrow. I did the seminar for the nurse's group at work today. They were so receptive. They are caregivers in every sense of the word and work so hard to keep our patients healthy. To be able to share with them encouragement and ways that they could care for themselves meant so much to me. I know how stressed and tired I am when I leave the facility and they work way more hours than I do. Most of them work the detox area so they see our patients when they are at their worst physically. I don't envy them their jobs. Tonight I went back to work and Rick went with me. We had a celebration of life for one of our counselors who died a few weeks ago. Rick and I did one of our songs to open the ceremony, it's called Family. It suited my friend and our workplace well. To work at an addiction center is a special calling, it truly is not for everyone. But I can say this with no hesitation about Deb, I feel so bad for the women who come through our facility now who never had the chance to have her for a counselor. We have many wonderful counselors, but none of them are like Deb. She walked the walk and talked the talk, life had not been kind to her but her hardships shaped her as a counselor and gave her the ability to help so many in recovery. She could see through the BS and knew what it took to survive and recover. Her life has touched so many. I miss her every day. A long day filled with many emotions. I need my hot tea and cozy bed. Full classes today, learning about ego and spirit and transformations. Mostly new faces and lots of emotions, but that's ok. When you have spent years numbing your feelings with alcohol and drugs, emotions in yoga are a good thing. There was some recognition today in eyes and faces that a peaceful heart was possible. I love seeing hope. Tomorrow I have been asked to do a seminar on relaxation, meditation and breath work for our nursing staff. I am doing one tomorrow and another one on Tuesday. I feel honored to be asked. I know how hard our nurses work and it is a joy to give back to them. Our weather has gone back to summer. 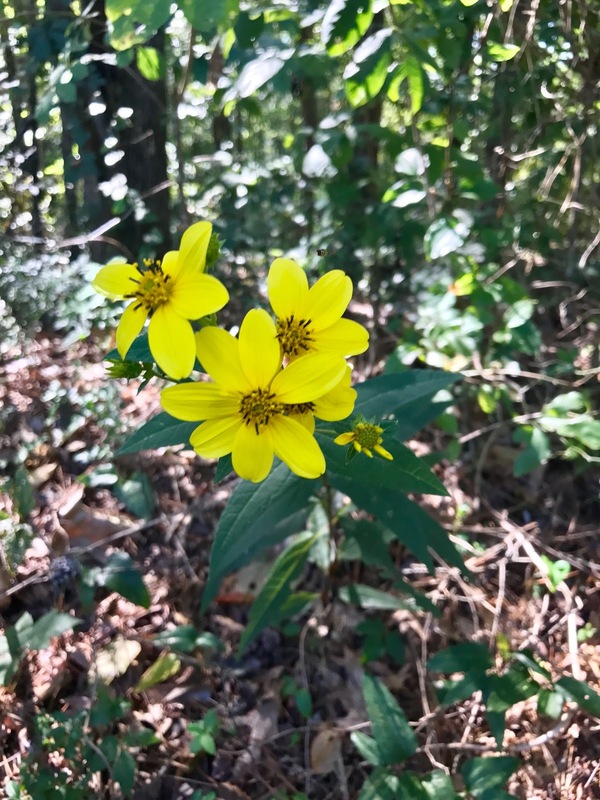 The past week temps have been near 90 degrees with humidity and rag weed pollen. I am so ready for fall. Wishing you a Friday that brings a weekend of good times, let's spread a double dose of kindness this weekend. I dare you! As I so often say, we have to look for the beauty around us. There are gifts everywhere, but most of the time they are so subtle we miss them. After a morning of errands and lunch with Rick, I stepped out the back door to enjoy nature. 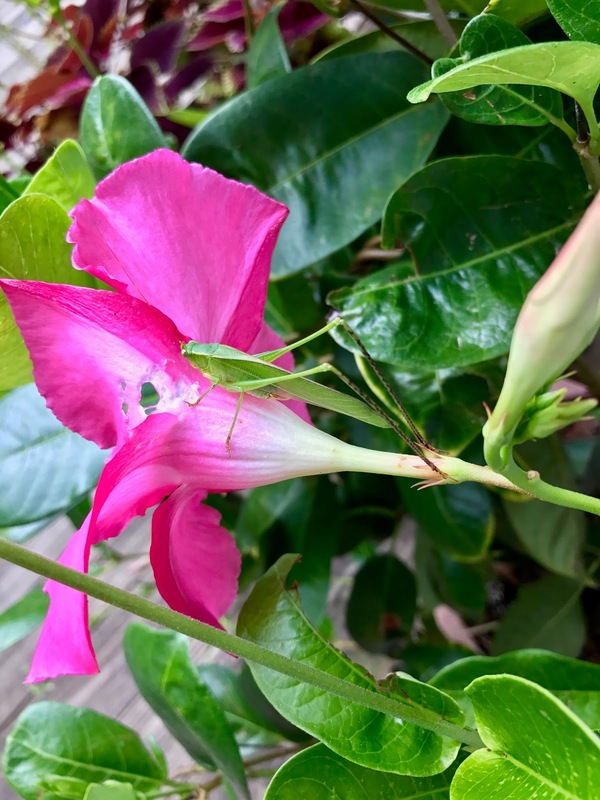 I glanced down at probably the last blooms on many of my plants and low and behold, there was Grasshopper. He was having lunch on a lovely pink blossom. He even posed for me as I took his picture. Enjoy the rest of your week. Look for the beauty around you and spread some kindness. A better day. No migraine, and very little vertigo today, so very grateful. One of my blog followers suggested I might look at a natural approach for relief. Everything I read about migraines and meniere's mentioned inflammation. I remembered I had a bottle of bromelain capsules and took a couple right after breakfast, within an hour I felt better. Not sure if the flare was going away or if the bromelain did the trick but I took another capsule this afternoon, so far so good. Will keep you all posted. In case you don't know what bromelain is, it is a natural anti- inflammatory made from pineapple. I had used it for sinus issues but had not thought to try it in other ways. It makes sense to me if there is inflammation anywhere in the body it should work. We will see. I am staying positive and keeping my fingers crossed. Classes today were about givers and takers, setting boundaries and learning to live like water. It felt wonderful to be able to teach with energy. I am so grateful for your good thoughts. I have an early morning class, so about to drink my hot tea. Short post tonight, still dealing with vertigo and migraine. I taught my classes today and tonight, not easy, but a cup of hot tea awaits me and my nice cozy bed. I hope your Monday was a good one. Be kind. It was near ninety degrees here yesterday with a high humidity. We walked the dogs later than normal and then spent much of the afternoon at the festival. Needless to say I got too hot. You might ask how does that happen? Well since the IVIG treatments that I did for 3 years, I stopped sweating. Honestly, I don't feel the heat until it's too late. Then I get migraines, vertigo and nausea. That happened when we got home last night. I walked early this morning, but I cooked this afternoon. Once again it was near ninety today, and once again the heat got me. I am not sure what to do. Once the symptoms start I take meds and if I act fast, they work. I know most who live in the south love the heat, but summers are getting more and more difficult for me. What to do, what to do? I hope your Sunday has been a good one. I hope you took a moment to see the beauty around you and to spread some kindness. Get your week off to a good start tomorrow, may life treat you kind, may you treat those around you kind. The Foothills Festival in Jasper, featured one of our favorite musicians this afternoon, John Paul White. If you don't know who he is, do the Google and listen to a couple of his songs. We saw so many friends, had such a good time. Hope your Saturday has been a good one. Hook found another yellow jacket nest today. It wasn't as bad as before, only two or three stings, but it brought back the memory of a couple of weeks ago. There for about thirty minutes he was in flight or fight mode, but finally the benedryl kicked in and he was calm. We spent time rehearsing for our gig coming up the first weekend in October. This will be our first performance at the event and we really want to shine. It is in Fayette which happens to be one of the cities where Rick has an office through the community college. We play on a Friday night and we are excited. There is a lot going on in cities near us this weekend. Tonight, one of our dear friends Max played in Muscle Shoals and tomorrow night, there is a music festival in Jasper. We had planned on going to hear Max tonight, but the lung infection that I have had for a few weeks reared its ugly head today. I am back on antibiotics so I should be much better tomorrow. Hoping we can make the festival tomorrow at least for one or two shows. After such chilly weather for the past week or so, summer has come back to visit. Upper eighties today and for the next several days. Ready for her to pack her bags and move on, so ready for fall. Enjoy your Saturday. Remember to be kind. All about boundaries, being grounded and understanding how you can have a big ego and still have low self-esteem, that was class today. Who knew how much yoga could teach you? Next week, compassion, wisdom and spirituality come into play. I saw the meniere's doc today. I always hope things will have changed, but nothing has. The migraines, vertigo, hearing loss, and all the rest just won't go away. Like the energizer bunny I just keep on going. Tomorrow starts the weekend. Plan something fun, do something kind. A classroom full of new faces today. Several struggled with the breath work and relaxation. Savasana or relaxation can be the most difficult part of a yoga class for many. We westerners are not wired for stillness and breath work. Well we are, our bodies and our spirits crave it, but our lifestyles have falsely convinced us that we don't need it. The need to be busy, to always be doing something cheats us from real rest and relaxation. The new students will eventually get it or they won't. Some are ready for the change in lifestyle, the journey to go inward, others will never be. I am so ready for my cup of hot tea and my moments of stillness before bed tonight. Another busy day tomorrow, seeing the meinere's doctor and then work the afternoon. Keep spreading that kindness, it makes a difference. Back to work today. Tuesdays students leave trauma or grief counseling and come to see me. Rough days. I make sure that Tuesday classes are nurturing and gentle. Sometimes students become very emotional because of things that they have faced in trauma or grief. They are also exhausted by the time they get to yoga class. Relaxation was almost thirty minutes today. Tuesdays drain me too. It has been cold and rainy today, the forecast is the same for tomorrow. Sunshine comes back on Thursday. That will be a good thing. Tomorrow is a busy day. Early morning class, haircut and then back to work tomorrow afternoon. Making up for yesterday. My cup of hot tea calls my name. Bedtime is early tonight. Be kind too all you meet tomorrow, be kind to yourself too. Because the forecast for Irma was so uncertain, I cancelled my class for tonight and did not go to work today. Thankfully, we have only had wind and rain and I must say it is chilly. Temps have been in the 50's all day. It is pouring rain and the wind is blowing, but so far all is well. Usually if I am home I am doing all sorts of house stuff and often working on class material. Today I chose to have a craft day. I have not done crafts since early summer with Jordan. I decided our door needed a new autumn wreath. I had so much fun and only burned myself once with the glue gun. For our friends in Florida I hope the floods subside soon and the power is restored as well. Spread the love and kindness this week. We all need a double dose. So it's wait and see with Irma and how she treats Alabama. Our schools are closed for Monday and Tuesday. The prediction is 2-4 inches of rain, winds 20-35 miles per hour and up to 45 miles per hour gusts. If we keep power and no trees down we will be very lucky. I watched as incredible blue skies began to be swept with white wispy clouds late afternoon. By sunset lots of clouds and the wind that has blown all day has died down. We will see what tomorrow brings. I spent most of the day yesterday and today cleaning out my closet. Samantha loves when I do that, it means she gets new clothes. Swim meets for Jordan are starting back up. He has practice 3 days a week and usually on Saturdays as well. He keeps telling me he will teach me how to swim. I dog paddle, I think he is in over his head if he thinks teaching me to swim will be easy. I can feel the atmospheric pressure changing. My joints hurt and my ear hums. If it is like it has been in the past, by tomorrow it will be hard for me to breathe. Out bodies are pretty amazing as they respond to nature. Wishing you all a good evening. Start the week with kindness and always spread some joy. So now Irma is looking westward, the Gulf of Mexico is warm as bath water and who knows for sure where Irma will land. So far we have rain and wind forecast for us. We live in a unique place, we have tornadoes, hurricanes and also snow and ice and occasionally small earthquakes. But, the past few days have been picture perfect early fall moments to be treasured. 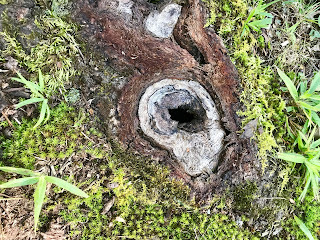 I took a picture today of my favorite tree root. It is a root of one our 100 year old oaks. It is gnarly, covered in moss and has the most interesting holes. Probably strange to say this, but I could sit and contemplate that root for hours. The textures and holes fascinate me. Where do the holes go, what lives there, so many questions. I hope your Saturday has been a good one. We have made sure the generator is working, all the yard equipment is covered and lawn furniture is stored. We are ready for Irma too. Sending thoughts to all in Irma's path, may you be safe. May everyone have a peaceful Sunday. Maybe an acorn the size of a quarter is no big deal to you, but after our heat/drought last year left us with no acorns, this one is wonderful. Knowing that our wildlife will have food this winter is important. My heart was full of joy as we walked today and noticed that for the first time in two years there are plenty of acorns. Yes, I am grateful for the lowly acorn, and the multitude of pine cones we are have now. It is the little things. So now the cone of Irma is coming into our neck of the woods. Lots of rain and probably some wind and who knows Irma may change her mind and go someplace else. But I think not. Everybody prepare, and let's hope for the best. Tonight, I am grateful for acorns and pinecones. Walking the dogs this morning in our 48 degrees felt wonderful. The dogs love these cool mornings. I let the big dogs take off for the woods when I open the gate, but Taz stays on a leash. As Taz and I walked the path she too wanted to venture into the woods, so we did for a bit. I am so glad we left the path. The yellow flowers, hidden in the forest were a gift from the universe. Sharing that gift with you tonight. Keeping a watchful eye on Irma. So many friends and family live in harm's way right now. FYI don't ever call the oral surgeon with a problem and think that you are going to see him for a looksie. There had been an issue with the surgery site, I called yesterday and of course the doctor's office said come tomorrow, he will want to see you. Rick was going to a campus about an hour north west of us, the surgeon's office is about an hour north east of us. No problems I said, just going in to check it out. Wrong. I sat down in his chair, he looked at the assistant who was asking if I needed to be moved to one of the surgery areas, panic was in my eyes. Dr. Clark ( who is awesome, by the way) assured me and the assistant that the problem could be taken care of without going to the surgery area. There were shots, cuts, snips and a big wad of gauze in my mouth and in a little while I was out the door. The people who saw me on my drive home must have had their doubts. There I am, a wad of gauze the size of an egg sticking out of my mouth. Tissues are in my hand as I am driving because of the numbness, and the drooling won't stop. Interesting day. But the moon is full and the sky has been blue and the temps tonight are in the 50's, life is ok.
Sending thoughts of safety and protection to our friends in the path of Irma. The Farmer's Almanac had predicted an active hurricane season, I am buying my 2018 issue soon. Those guys are the weather gurus. Spread love, kindness and joy to everyone you meet tomorrow. According to our star gazing friends, this full moon brings an end to eclipse energy and ushers in powerful celestial energy shifts. Hoping for good for everyone. Full moon tomorrow night. Of course we did moon salutations in class today! The temps are dropping here tonight, but all eyes and ears are on Irma. Hoping for the best, but encouraging our coastal friends to prepare for the worst. Early morning class then a visit to the oral surgeon for a check-up tomorrow. My speech is still wonky because of the flipper I am wearing. It's a fake tooth to get me by until the implant in January. This has not been my most fun thing ever. I am spent this evening. My body is still fighting the lung infection so my energy is low. Hump day tomorrow, be kind, spread joy, show some love. If the skies permit, be sure and moon gaze tomorrow night, it should be a beauty. New students today. For most of them, it was their very first yoga class. It is interesting to watch their faces as class starts and then look at them when class is over. Today everyone of them said they couldn't wait to come back. The students were so appreciative that I came into work today. Today was a holiday at the school where Rick works and I thought about taking the day off as well. But, I knew there would be several new people that had entered the program during the past few days and yoga class is a great way to release the stress . 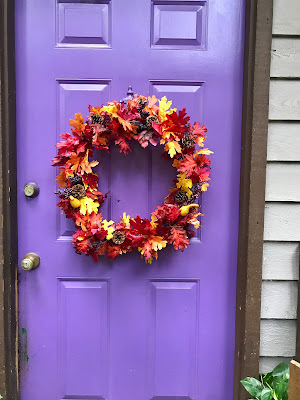 I take the big holidays off like Christmas and 4th of July and Thanksgiving, but even though as a blue collar worker's daughter this was an important holiday, I felt the need to work. There is a full moon this week. It should displace all the weird energy from the eclipse. Lots of changes taking place in the sky this month. Those wacky planets are on the move. Time for a cup of hot tea and I am so ready for it. Rain is moving in tomorrow and it did not take a weather man to tell me that news. My aching joints shouted it loud and clear. Make this a week of kindness. 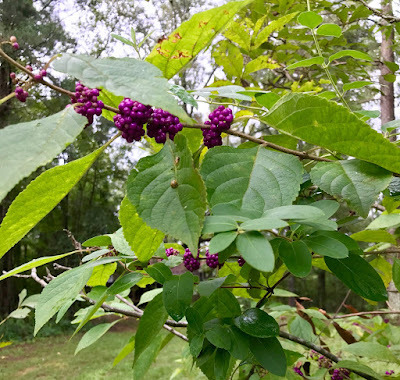 When the beauty berries turn purple, fall is beginning here. They are my favorite shade of purple. Our mornings have been perfect porch weather. Drinking coffee on the porch does a body good. My brother and his wife, Sam and Jordan and my sister Pat and her daughter Jayna ate dinner with us this evening. Just laughing, talking and sharing a meal. That also does a body good. For many tomorrow is a holiday. I will be working, but that's ok. I have had a good weekend. Enjoy your Monday, laugh, be kind, and hug one another. Monsoonal rains and morning walks bring surprises. 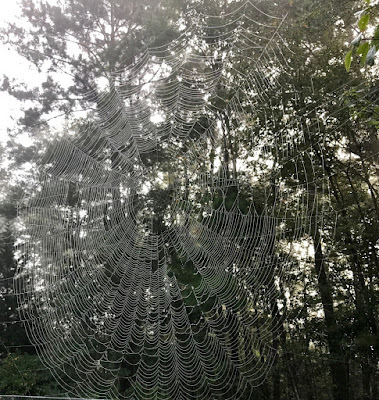 Walking down by the barn this morning, this artful creation appeared on our path. I love the shapes and colors. Wishing all a peaceful Sunday.